Several weeks ago I was contacted by Jason Hoffman, a Scrum master, to see if I would be interested in meeting up with others in the Madison area that run Agile projects, work on Agile projects or folks who are just interested in hearing more about Agile. Previously Jason use to attend meetings like this when he lived in the Twin Cities and he wanted to start something up like it in Madison, WI. This past week we had our first meet-up with 5 people in attendance. We spent the first 90 minutes with each person talking about their backgrounds, how they are using Agile in their organizations and what some of their frustrations were. 1. How do you pull out traditional project management metrics to feed the PMO? 2. How do you get buy-in to start your first Agile project. 3. How you can blend the SDLC process along with using Agile techniques. Okay, so let’s take #3 for a spin … One of the attendees Brice Ruth is a contractor at American Family Insurance. Brice indicated that AmFam has an internal website dedicated to Agile SDLC software development projects. It is great to see an organization that is willing to blend the two together. In the last 30 minutes of our meeting we brainstormed some topic ideas for future meetings. The next topic will be “Tools you use when managing Agile projects”. Meeting date is 11Jan2011. Help! My team members are in multiple locations! 1Dec2011: Please click above if you want the most recent Blog posts^. Recently I had a short discussion with Kara Rose the current President of the PMI of south central/ Madison Wisconsin chapter about issues the board members were having with document reviews, and having a place to have online discussions. She indicated to me that they were currently using yahoo groups and it was clunky and not user friendly. She also mentioned that they were looking into setting up a SharePoint site, but was not sure who would host it. After this I mentioned to her a few online applications that exist, and that I would think a bit about their issues to see if there is a good cheap product out there on the interweb to fit their needs. I checked my notes on online PM applications and I think that an application from Teamworks may fit their needs. This was very easy to do and you can use an outside email address (any email address will work). Then you can determine if you want the system to send them a generated password or create one for them (the user, when they log in, can then change their password). You would then create a project (I’ll review that at in another post), and below is what you would see from the top level of a project. The key tabs for this discussion are: Files and Messages (also, I noticed that there is a news type feed that shows all the recent updates and a section to set up a RSS Feed). Within the Message section it is a normal message forum with one twist. It will allow you to indicate who you would like an email sent off to let them know that you posted a comment (much like you can in SharePoint). Easy to upload, determine who can see it, add notes to the file. Version history. If someone downloads the file, edits it and uploads it in the same spot it creates a new version of it. Comments section for each file (again with a notification feature), which is nice to see. The Cons to the file review section is that 2 people could take the file out at the same time so your versioning won’t be correct. No file review workflow with a must be completed by date followed by automated emails to the users that have not completed the task (all things that SharePoint has). This is the most competitive pricing structure I’ve seen, because they base their prices on the number of projects and gigs of data with unlimited users. Now for the PMI board their best option may be the one in the small print. 2 projects and 5mb of storage. One project for PDD and one for general items. Hey, you cannot beat free, but if you need a bit more space and a few more projects $12/month is not that bad either. So for basic needs of a small committee of people TeamWorksPM.net may fit your needs (I’ll find out more in the next month if it truly has many of the common items we need to help us communicate out the on-goings of our projects). Recently I had a chance to check out Project Central 2.0, a SharePoint plug-in From Bamboo Solutions. Bamboo offers many project management related plug-ins for SharePoint. When you log in there is a nice dashboard of information of all the projects in your portfolio. My only issue with this first screen is that you have to scroll to the right to see all the information. Within this view you will find all the common tabs you would need to quickly jump to. When setting up a project there is a great summary screen for the project, where you can define your team, see upcoming tasks, announcements, recently updated documents, and so on. These are typical things you would expect to see when developing a dashboard within SharePoint. I do like the idea of an icon that you click that will send out an email to all on the project (no need to bother IS admin to set up a universal mailing list within Outlook). You can enter the items into your project timeline. Each new item has a ton of information that you can enter that will feed the other parts of the application. I was a bit disappointed that I didn’t see a button to import a Microsoft Project document into the system (you have to purchase an additional add-on for this). They do offer different views, and an option to baseline the project, but I didn’t see anything for viewing the critical path. There is a section on resource management, it is nice to have this option so you can easily see if a person is over allocated and when you add a person to a project you can put in what percentage of time they will have on the project. There is a full section on risks, and each risk you enter has all the key pieces of information you would normally collect, which is used to determine its spot on the impact and probability chart. No templates, it would be nice if they had a section on Agile management with burn down item logger and a burn down chart. Overall I think it is a great application at a fair price. Could you ask your companies programmers to build an application like this? Sure. But it is much more cost effective to purchase this one so you have all the key items you need to help capture the needs and the plan of the project. Several weeks ago I attended a presentation titled: iPad in the Enterprise presented by Jake Scherrer of Centare. Link to his presentation. In the presentation Jake went over Apple’s mobile devices and where the future may lead too. Apple’s 3 main mobile devices are the iPhone, iPod touch and the iPad. Currently there are many new companies that are popping up to help you create apps that work with mobile technology to help you access your data basically anywhere. There are many professions today that this will be huge help to speed up workflows and getting data to the masses quicker. One of the first hurdles will be the enterprise concerns with security (if I lose my iPhone will the finder now have access to my email and custom built apps?). Apple seems to have this locked down pretty well with the ability to lock and format and push new updates to the iPhone remotely). Another hurdle is, how the heck do you get Apple to okay your custom made application for your client. Apple is getting much less restrictive of this and their review process. Any type of data you have access to on your PC you should be able to have access to on your mobile device. An example they gave was an app for collecting names of interested clients at a trade show (you know, you have a booth and folks drop off their business cards in a fish bowl which is replaced with an iPad app). Rewards for service. Remember the days when you were with an organization for 5 years you received a tie tack, and 20 years you received a watch? How about after 2 years you receive an iPad with some custom apps for your company to help you keep track of what is going on in the office from the road or at home. 1. Realtor app so they can look things up and take notes. 2. Project app so you can see project details or look at shared documents (like box.net has). 3. Trade show booth, to show videos about your organization, or give the user hands on access. 4. Doctors, who can re-view images from anywhere to give input on diagnoses. 5. Police reports, with dictation ability. This could be so much more than just email! Think about the data you capture and how you could use it to help your organization work more efficiently! Several weeks ago I attended a 2 day class at the Fluno Center (University of Wisconsin Madison) on Project Portfolio Management. The class was taught by Barbara Schrage, PMP , who previously was Vice President of a centralized PMO in a Fortune 500 company. Out of Scope for the class were: PPM software applications (which made me a little sad, but I have a pretty decent grip on what there is out there). During the first day we went over what a portfolio is and some of the challenges of implementing them. Here I saw all the basics including having staff that are unable to understand resource capacity. We also spent a lot of time on governance. During the second day, we talked about integration and strategic processes, mixed in some hands on items (using a pre-made Excel file to help select the right projects; screen shot below) and spent a decent amount of time getting input from the students as to what they see in their own organizations. I really enjoy attending the classes offered at the Fluno Center. Not only do I learn from the teacher, I learn from the people in class. The Project Portfolio Management class is an excellent class for an organization that is thinking about starting up project portfolio management, or for the person that is currently doing it as a refresher course. Check it out! Recently I attended a webinar presented by Corasworks on their updated Project Portfolio manager that integrates with SharePoint (PPM v.2.0). This past winter I reviewed their application and they have many new useful updates. They have included several new templates for managing projects using PMI or Agile methodologies and a custom template to make your own. Microsoft Project documents still have the ability to push and pull from the product. New edition to the timeline view includes the ability to see the critical path (many portfolio software apps do not have this). The ability to take snapshot of the timeline (so you can look back to see where you were at, at a certain point of time, much like baselineing). GANNT chart view with the ability to move items by dragging and the ability to link items via this view too. A community board for project team members to share updates (which includes a rating system, and the ability to tag items so they are easier to find). I really like this because it could take some of the email discussions out of email into your project site (great place to have all that key communication in one spot). Section to submit project proposals that will move through an approval workflow. Updated Risk tracker to easily move a risk to the issues log. A mobile app so you can see some project metrics, or see all of your tasks. The mobile app is cool but the ability to update from it is very limited. In the video it gives examples of clicking on an open task which automatically moves it to 5% (what if I’m at 50%?). Also you can move KPI to green, yellow or red. Typically these move based on project metrics you set up, if not and you do it manually that is fine too. If you move an item to Red I would like the ability to write why it is red. The mobile app needs more functions like box.net (the ability to view documents) to really be useful and needs a project newsfeed (more below). eSignatures for sign-off on sections within the project and on any documents that have signature lines (we currently have a 3rd party app that does this for us). They talk about web 2.0 social media parts (community part), but I think they need to expand this. @task is coming out with a new update soon that will include a newsfeed for your project. I would imagine the project newsfeed would include things like. Then you can control this by turning updates off that you are not interested in (say you don’t care when documents are added or updated). You would see the updates for your project and there would be a view for updates for all projects flowing into one newsfeed. Also how about a section for what a person is working on for the day? Nice way for managers to check up on staff (and a great check-up of Agile projects). My first experience of trying an Agile methodology was a hit, but we needed to fine tune our process a bit before we tried it again. Our first step was to put together a template within SharePoint to help us gather and track the project information. Below that is a list of the most recent documents in the document library (this is also where you will find a Microsoft timeline). Below that is the project discussion section we used to capture meeting notes in (microblogging). Each backlog item has some key pieces of information which helps us put it into the right sprint and allows the developer to capture notes. An Issues log. As changes were made, and testing happened, if we ran into an issue we tracked it here. Finally there is the test plan section that pulls the short description from the backlog item. 1 … 2… 3… go! So with this in hand we started up our next Agile project, which was v.2 of our first Agile project. There was one big difference with this project in that there was a constraint of 6 weeks to complete v.2 (which included a whole new section to the website, some code fixes, moving data to SharePoint to create a digital workflow with alerts). And finally the killer … we had to use a QA representative to create a formal test plan. We put together a small team. 3 expert users. 2 programmers (one php expert and one SharePoint expert). 1 QA rep. 1 PM/Scrum guy (me, it is funny how these mission critical projects keep landing in my lap). We started out with normal Agile methodology telling stories and breaking them down into backlog items (remember the backlog items are now in SharePoint). Then we put together the timeline (keeping that must end by date in-mind). Meetings were scheduled for the duration of the project which included Mon, Wed, Fri 15 minute status updates (what I did, what I’m going to do and a little show and tell) and one 1 hour meeting on Thursdays (short update, but more show and tell, workflow, reviewing requirements, reviewing documentation, expanding timeline tasks as needed). Again all of the meeting notes were captured within SharePoint discussion board and any changes to the requirements were also updated. Part of our communication strategy was a short weekly update email (by me) sent to the executives (to calm their nerves about hitting the timeline). Once we had a working prototype I included a short 5 minute video of the product in use (so they could really see we were making progress); this is a great example of using web 2.0 technologies to communicate the project status. The project was a success! We came in 2 days early and our client was happy with the results! And yes, we did get cake! There were many email discussions about various parts of the product that were not tied back into the project site (it is possible within the SharePoint discussion boards to have an email address assigned to a project to capture project related email). Timeline is still in Project. For a project this small it wasn’t really an issue (20 tasks versus the normal 1000 I’m use to). Small team of experts and many meetings was the key to the success of this project. If we used waterfall methodology we would of blown by the “must end by date” before one line of code was written. Project size. Again this was a small project using experts who have coded similar products in the past. This was key for the project to hit the end date or come in early. Dux Raymond (@meetdux) recently tweeted that FREE copies of “Empowered” were available for the Kindle via Amazon. My favorite “F” word is free so I downloaded it. I was a little concerned about spending time reading it knowing that there are hundreds of social media books out there and many of them are outdated the day they are printed. Luckily it was a great book and will be a benchmark social media book for at least the next year (why does technology move so fast?). "Your company is not and cannot be nimble enough to serve them. With your established processes and departmental boundaries, you move too slowly. Only your employees can help. And only if you unleash them." Further: "To succeed with empowered clients you must empower your employees to solve customer problems." They also have many case studies (Dell, Ford, Best Buy, NHL, Quickbooks, E-trade, UPS, Black and Decker, Eagles Stadium and others) to show a bottom up flow of ideas from people they call HEROes (Highly Empowered Resourceful Operatives) who are key to making these ideas work. The HEROes are driven by a desire to create improvements on their own initiative rather than to live with the status quo. Many of the examples in the book revolve around customer service. You know, those clients that can blog or tweet and bring you thousands of negative impressions over-night. There is also an excellent section in the book on selection criteria for selecting HERO projects and tips for creating governance boards and teams for internal monitoring and gaining buy-in from senior management. They also touch on things like SharePoint (it could be a HERO idea to have a document repository or workflows). Did you install it and send out the company wide email and saying, “please use it” only to find out that no one is using it? As with any new application people hate change. If you won’t put the effort in training and re-training and keeping it in their faces they will never use your new HERO application. Overall I thought the book was easy to read and understand (with the real world examples mixed in) and it has a nice flow on how the process works. So if you are looking to add a little social media to your organization, this is a great book to start with. Where did the term “software bug” come from? Recently one of my co-workers gave a presentation on software bugs. Typically “bugs” are a negative thing but here is story that will help you to keep it simple during your bug search. So where did the term software “bug” come from? Back in the 1940’s the first computer was built for the military to calculate ballistic trajectories. It weighed 30 tons, took up 15,000 sqf, had 19,000 vacuum tubes, 100’s of mechanical relays, and cost $500,000 to build. To put this into perspective, a common calculator you use today is more powerful than this machine. When the machine started to have errors an inspection was done and Admiral Grace Hopper team found a moth in relay #70 as she noted in her lab notebook (and she even tapped the moth to the notebook page!). So the next time you stumble upon a bug think of Grace and that moth! Are you looking to obtain your PMP? When I made the decision to move forward with obtaining PMP status I put together a game plan. First I needed 35 contact hours worth of class time. Check! I had already completed my master certificate in Project Management offered at UW Madison at the Fluno Center. I had plenty of project time already under my belt. Check! So then I was ready to apply and study a bit before taking the big test. My study materials included the PMBOK (yes it is a hard read but it is full of information), Rita Mulcahy PMP prep book, and various websites that offered practice exams. After a couple of months studying I took the test and passed! Now we fast-forward to today … what would I have done differently? If I needed the 35 contact hours I would have liked to have purchased some webcast or video webcast that I could view, take notes and then review whenever I wanted. There are so many classes out there that cost $700-$2000 that give you 35 hours but when you walk out the door you are on your own! I was recently contacted by the folks at PM Prepcast (created by Cornelius Fichtner, PMP) about reviewing their Prepcast videos. They have it set up with videos you can view on your PC or your ipod. There are 120 videos to download and you can go back to them anytime to review them. I have viewed several of them and have also slipped my ipod into my pocket and have gone jogging with them (I know … I’m a Project Management Geek). The PM Prepcast is just one more tool you can use to help study for the PMP exam. If you are more of a visual type of learner this is the product for you! Also, the product comes with a practice exam. Some of my best learning was done taking practice exams. Cost? $99.97! That is a bargain! And it includes your 35 contact hours and you can review the videos again and again. So if you are a visual learner and/or you need 35 contact hours the PM Prepcast may be one more tool to help you obtain your PMP status! System development projects should be done by the smallest possible team of talented people, using a short schedule, a small budget and mature technologies to deliver innovative solutions to urgent needs. This approach is called FIST: Fast, In-expensive, Simple, Tiny. Short timelines increase agility and stabilize requirements, technology, budgets and people. Short timelines also force accountability, ownership and learning. To maintain short timelines, a project must also exercise restraint over budgets, complexity and size. Increases to the project’s budget, complexity or size inevitably reduce its speed. Minimize team size, maximize team talent. Use schedules and budgets to constrain the design. Insist on simplicity in organizations, processes and technologies. Requirements must be achievable within short time horizons. Designs must only include mature technologies. Documents and meetings must be short. Have as many as necessary, as few as possible. Delivering useful capabilities is the only measure of success. Is On Time Often Over-rated? Is delivering something on time more of a goal for most of your projects? Many projects never set firm end dates because they understand that the project requirements may change throughout. When the project ends, typically past the original end date we celebrate! Right? Yes! Cake for everyone because we knew upfront the date would slide. Now what about the project that has set requirements and you blow by your initial end date by months and the product is full of bugs? Cake for everyone! Why? The project needed to be completed and the lessons learned were that we didn’t have the right durations for the timeline. Now what about an end date constraint? We hit the end date, but several of the requirements needed to be dropped to meet the timeline. Cake for everyone! Many times on time is defined by the organization. Many organizations understand that dates may be pushed, or requirements dropped or added, or finished software may have bugs. If this is business as usual then you may be eating a lot of cake! The true indicator is how risk adverse the sponsor is to a slipping timeline? They may be the first to market for a product so they may have a low threshold for slippage. Or if they are building a software package that is a must have for the business, but they have an older system in place that is working fine, then they may have a higher threshold for the timeline to slip. How do we control this slippage? Make sure you have all of the right stakeholders at the start to define the requirements and build the timeline. Bonus structure. I’ve seen and have worked for organizations that have given a bonus to the PM (and sometimes other stakeholders) for meeting a milestone like the end of the project on time. Communication! Remember 90% of managing a project is communication. Or you can “Let them eat cake”! Recently I attended a seminar on team facilitation at UW Madison, and one of the topics we covered was decision making tools. One of the tools we reviewed and tried out was dot voting. Dot voting can be used on items such as identifying which projects to start first, which issues to address first, ranking items within a burn down chart, or simply using it after brainstorming to help select the items you want to focus on to move forward. 1. Each person is given a 10 dots (or post-it notes work well too), and they are instructed to indicate their priorities, they are to use all their dots, but no more than 4 on any one item (4 = their top priority). 2. The items are posted on a flip chart (you may need multiple flip charts, or give participants more dot) and the participants place the dots on their priorities. 3. When everyone has placed their dots, count the dots, and typically there are a few clear winners. 4. Now the discussion starts on which projects (or items) should be ranked the highest. This method is a good visual aid, gets people out of their seats, and should help to limit discussions on picking the top ranking items. Recently I received an advance reader’s copy of Taming Change with Portfolio Management: Unify Your Organization, Sharpen Your Strategy and Create Measurable Value which is now on available at Amazon (and available on the kindle). 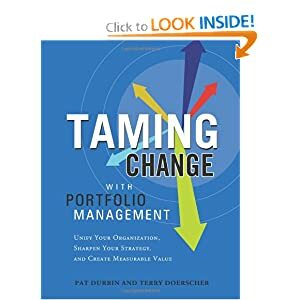 Pat Durbin and Terry Doerscher (both from Planview) have developed a guide for managing change within the modern portfolio management that provides organizations of all types and sizes a way to effectively manage changes impacting all areas of the organization. I'd recommend it to anyone who wants to understand how portfolio management can be integrated into a program for effective project control. Recently a colleague of mine told me about a short video by Tom Wujec on team building. Tom has conducted this exercise over 70 times with groups from kindergartners to CEO’s and has some pretty interesting results. Teams of 4 have to build the tallest tower they can within 18 minutes and at the end you measure from the bottom of the structure to the top of the marshmallow. This forces people very quickly to collaborate. One of the interesting findings he has seen during these tests is that kindergartener’s tend to make prototypes and on average had taller structures than CEO’s. Where as adults would discuss, jockey for power, build and then at the very end put the marshmallow on top and hope it would stay standing. Learn from the kindergartners and prototype your software development projects. This is especially important during long complicated builds. @task has a new application they are developing to try to tie in some social media communication within their application. The application is what it was before with tasks but it is now in a more user friendly platform with drag and drop capabilities and communication at the task level. 1. 1. You have the ability to track tasks to the person assigned to them (maybe this is incorporated into their yearly review). 2. You can be part of a project and see the news feed type of updates as things are completed, comments or things are updated. 2. 3. The users have the ability to type in status updates and suggest when they think they will be done, and they can prioritize their own lists (so you can see when they may work on your task next). 3. 4. Shows baseline, what people are planning to do on a task, and highlights the critical path. 5. You can attach files to tasks (maybe a mock-up of a screen shot). 5. 6. If someone reply’s to your comments you are notified. 6. 7. Has dashboard views you can customize including % complete, EV and comments on the project. Overall it looks to be a pretty simple to use product that looks like it would work well if one was running a project in an Agile environment. Social Media Policy for your workplace? Just what we need is another policy right? Social media looks like it is powering on and is capturing more users’ everyday including at the workplace. GASP! Not at your office, right?!? In a recent study as many as 50% of companies have put the lock down at the firewall level to stop employees from accessing places like Facebook, Twitter, and Youtube. And Palo Alto Networks is coming out with new software that will give Facebook the ability to create groups in the office to determine who can write messages or give a group the ability to read only. Do you really need a policy? If you are worried about your company’s image out on the interweb, as represented by employees within your organization, then I would say yes. Also, it may be nice to set some guidelines up on how it may be used within a project (you may want to include this in your communication plan within your project). Are you monitoring the buzz about your company on the web? If you are not, you better start. If that one negative review is the first thing that pops up in a google search you better know about it! Monitoring can be done by opening a google alerts account that will notify you if your keyword (company name) is found in a website. Or you can purchase software to do this from organizations like Networked Insights. What is in a policy? 1. Don’t forget your day job. You need to have a statement like this within the policy if you plan to have an open network (no locking down of social networks). You may want to take it to the next level about reserving the right to remove or limit their access or possible termination if they are abusing it (not getting their work done). 2. Rules for engagement. Include items like not discussing confidential information and if you would not say it to your grandmother you probably should not be writing about it. One of the best policies I’ve read is from the company RightNow. They used social media policies from Intel, Sun Microsystems and IBM to development theirs. If possible, try to steer clear of writing it up like a legal document (social media policies for states and cities are like this).